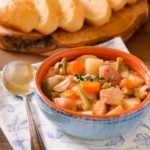 A recipe for turkey stew made in a crockpot or slow cooker. The stew has a light broth and is filled with turkey, carrots, onions, potatoes, rutabagas, green beans, garlic, and fresh herbs. Combine all ingredients in a slow cooker and cook on low for 8 hours or on high for 4 hours. *Remove silver skin and tendon from the turkey tenderloins before cutting into chunks.